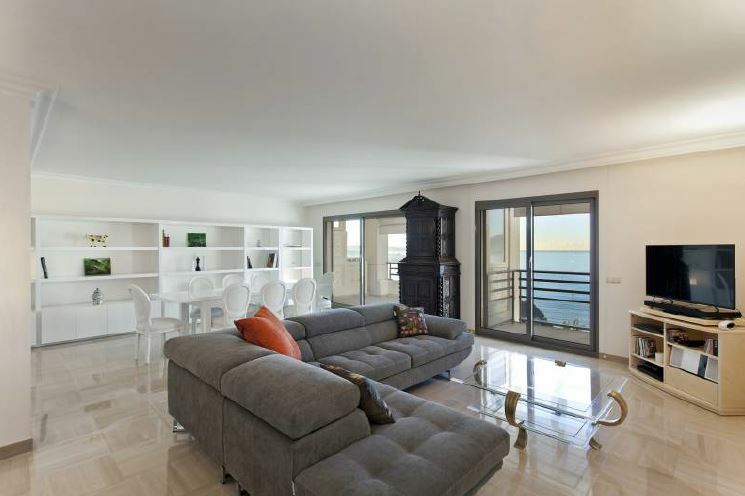 This apartment has a double living room which opens onto south terraces which enjoy a beautiful sea view. There is a dining area for 8/10 people provided. The lounge area has a sofa for 6 people and a flat screen TV. The kitchen is fully equipped with a halogen cooktop, hood, oven, microwave, fridge/ freezer and US fridge, washing machine, dish washer and Nespresso coffee machine. The kitchen opens onto the north veranda, and there is a corridor leading to the sleeping area and guests toilets. The first double bedroom opens onto the north veranda and has hill views, with 1 double bed, a dressing, and an en-suite bathroom. The second double bedroom also opens onto the north veranda and has hill views. It is composed of 2 twin beds, a dressing, a safe, an en-suite bathroom with double basin, large bathtub and toilet. There is a nice north orientated veranda which is fitted as an office area, which has hill views. There is also a single bedroom which opens onto the south terrace and has a beautiful sea view, with a bookcase, desk, safe and en-suite shower room. There is Wi-Fi, air-conditioning, electric shutters and blinds and a videophone.